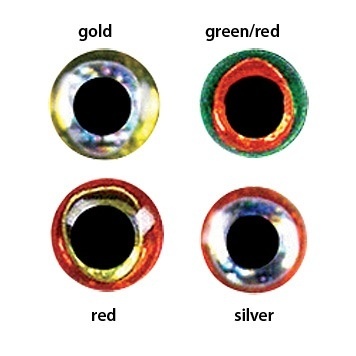 Our fly tying fly eyes have three layers of color with a black pupil. In red, red/green, silver, gold. 6mm and 8mm designed for saltwater; 4mm and 5mm fit into recessed dumbbells. Also in 3.5mm. 20 pieces per pack.